In this live-action/puppet series, the Muppets host a variety show on their own TV station, KMUP, with Clifford the Catfish (Kevin Clash) as host. 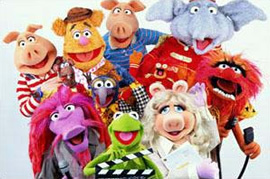 Old favorites like Kermit the Frog (Steve Whitmire), Miss Piggy (Frank Oz), Gonzo the Great (Dave Goelz), and Rizzo the Rat (Whitmire) run the studio with the help of new characters like security guard Bobo the Bear (Bill Barretta), dimwitted elephant Seymour (Brian Henson), Pepe the King Prawn (Barretta), inane Bill the Bubble Guy (Goelz), crazy scientist Dr. Phil van Neuter (Henson), and lounge singer Johnny Fiama (Barretta) with his monkey assistant Sal Minella (Henson). From the comfort of their rest home, curmudgeons Statler & Waldorf (Jerry Nelson and Goelz) still dish out insults. Each episode features a celebrity guest star performing in various skits with the Muppets and enduring the commotion backstage during the show. Regular skits performed were parodies of television shows like Baywatch (“Bay of Pigswatch”), Star Trek: Deep Space Nine (“Deep Dish Nine: The Next Generation of Pigs in Space”) and ER (“E-I-E-I-O R”). Celebrity guests include Pierce Brosnan, Billy Crystal, Martin Short, Sandra Bullock, Prince, Michelle Pfeiffer, Garth Brooks, Billy Crystal, Tony Bennett, and Cindy Crawford.